Herbs, shrubs, or trees, variously pubescent with stellate, simple, and/or glandular hairs. Leaves simple and often palmately lobed to divided, rarely palmately compound, alternate, nearly always petiolate, stipulate. Flowers perfect or rarely unisexual, axillary, solitary or in cymes, collectively often forming spicate to paniculate or even head-like inflorescences, ± with an involucel subtending the calyx, the bracts distinct or basally connate; calyx composed of connate sepals, (3-)5-toothed or (3-)5-lobed, sometimes irregularly cleft or truncate, the lobes valvate in bud; corolla actinomorphic to moderately zygomorphic, tubular to rotate or reflexed, the petals 5, obovate, distinct from each other but adnate at base to stamina] column, convolute in bud; stamens 5 to numerous, monadelphous, forming a staminal column; filaments terminating the staminal column or borne below a 5-dentate apex; anthers monothecal, pollen globose, echinate; ovary superior, (1-) 3-celled to many-celled, the carpels borne in a single whorl or rarely seemingly superposed whorls, placentation axile, ovules 1 to numerous per cell, ascending to pendulous; style exceeding the staminal column, unbranched and stigmatically lobed at apex or branched, the branches as many or twice as many as carpels; stigmas terminal or decurrent. Fruit a loculicidally dehiscent capsule, but essentially indehiscent in Thespesia, or a schizocarp separating into mericarps at maturity. Seeds reniform to turbinate, with or without endosperm. A family comprising about 100 genera and 2,000 species, essentially cosmopolitan in distribution, but most strongly represented in open, sunny habitats of warm temperate and seasonally dry tropical regions. The family includes many ornamentals, and a number of species are pantropical weeds. Represented in Hawai'i by 16 genera, 2 of which, Hibiscadelphus and Kokia, are endemic, with 19 endemic, 25 naturalized, and 5 indigenous species (3 of the latter may be Polynesian introductions). Abutilon, Sida, Gossypium, and Hibiscus include endemic species, while Thespesia is represented by a single possibly indigenous species. 1. Fruit a loculicidally dehiscent capsule or in Thespesia essentially indehiscent, 3-5-celled (2). 1. Fruit a schizocarp, mericarps 5-30, indehiscent or loculicidally dehiscent (7). 2. Involucral bracts 4-14; style 5-branched, stigmas terminal; plants not glandular punctate (5). fruit; capsules 1.1-5 cm long (6). green, dark purple, or magenta; calyx usually circumscissily dehiscent in fruit. 7(1). Style branches 10, twice as many as carpels (8). 7. Style branches 5-30, as many as carpels (10). 8. Flowers axillary, solitary or clustered, without subtending foliaceous bracts (9). 11(10). Mericarps 6-25 mm long, 2-9-seeded or if 1-seeded, inflated (12). 11. Mericarps 1.6-4 mm long, with a single pendulous, trigonous-obovoid seed, not inflated (13). 14. Stigmas terminal on the style branches (15). A genus of 6 or more species native to southern and southeastern Asia, the Philippines, Indonesia, and other southwestern Pacific islands to northern Australia. Three species are cultivated: A. esculentus (L.) Moench, okra or gumbo; A. manihot (L.) Medik. ; and A. moschatus; all of these have been or are cultivated in Hawai'i, but only the last has become naturalized. Name derived from the Arabic ab-el-mosk, the father or source of musk, alluding to the musky odor of the seeds, or perhaps from habbel-mosk, musk seed. Erect perennial herbs or subshrubs 2-3(-4) m tall; stems usually hispid, the hairs simple, oppressed or retrorse. Leaf blades basically orbicular in outline, up to 30 cm wide, shallowly to deeply 3-lobed, 5-lobed, or 7-lobed or parted, the divisions deltate to oblong-lanceolate, margins coarsely serrate to dentate. Involucral bracts usually 6-10, linear to lanceolate, 9-15(-25) mm long, 1-2.5(-5) mm wide, usually persistent to early fruit; calyx (1-)1.8-3.5 cm long; petals yellow, purple-spotted at base, (4-)7-9 cm long. Capsules dark brown to black, ovoid to oblong, terete or slightly angled, 5-8 cm long, usually hispid. Seeds 3-4 mm long. [2n = 72.] Native to India and southeastern Asia, New Guinea, and northern Australia, cultivated for stem fibers, seeds (which have a musk odor), and occasionally as an ornamental; in Hawai'i occasionally cultivated and known from a single naturalized collection (Heller 2553, BISH) made in 1890 from near the falls of the Hanapepe River, Kaua'i. Cultivated prior to 1871 (Hillebrand, 1888). A genus of perhaps 150 species, principally of the New World tropics and subtropics, but also in similar regions of the Old World and a few species in temperate regions. 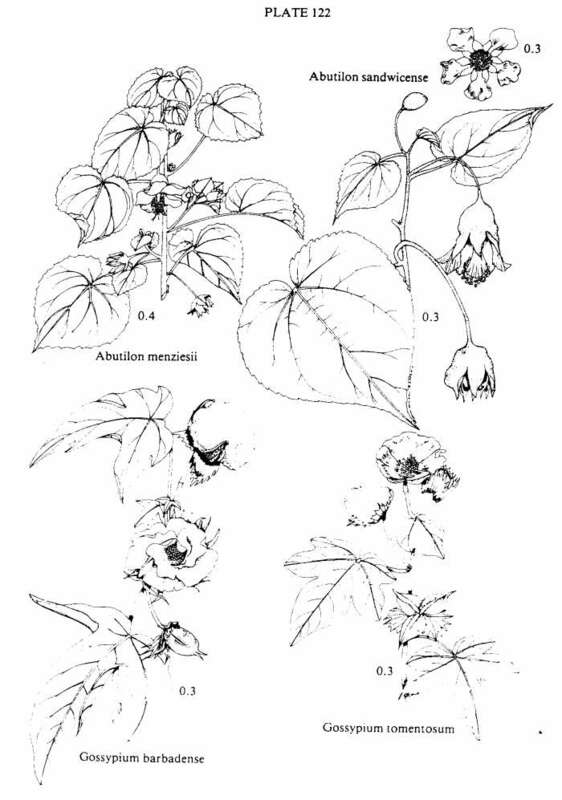 The native species are the result of 2 or 3 independent colonizations, represented by: (1) Abutilon incanum, if native; (2) A. eremitopetalum and A. menziesii,. and (3) A. sandwicense. Abutilon is a Greek name, apparently of Arabic origin, for malvaceous plants. Abortopetalum was established by Degener (1932c) on the basis of the reduced or "aborted" petals and other characters of A. sandwicense. The genus is encompassed within the morphological range of Abutilon, a fact noted by Christophersen (1934). 1. Corolla yellow to yellowish orange or orange, veins sometimes maroon basally (2). 1. Corolla pink to maroon, green, or reddish brown, sometimes yellowish at base (4). 2. Stipules linear to subulate, 3-15 mm long, 0.5-3 mm wide (3). 4(1). Corolla pink to maroon or white to yellow, rotate or reflexed (5). 4. Corolla predominantly green or reddish brown, included in the calyx or campanulate and exceeding it (6). Subshrubs 1-2(-3) m tall, velutinous or tomentose with stellate and simple hairs. Leaf blades broadly ovate to orbicular, 2-20 cm long, margins dentate, apex acuminate, base cordate with lobes sometimes overlapping, petioles about as long as blades, stipules broadly ovate to orbicular, 10-15 mm long, 5-12 mm wide, base cordate to auriculate. Flowers in terminal racemes or panicles, pedicels 1-3 cm long, articulate; calyx 0.5-0.7 cm long, lobed to near the base, scarcely accrescent; corolla rotate to subreflexed, petals yellow to pale orange, purple-veined basally, 0.8-1.2 cm long; staminal column up to 8 mm long; style branches and stigmas maroon. Schizocarp dark brown, broadly urceolate-retuse, 9-12 mm long, 1.3-1.8 cm in diameter, white pubescent, mericarps 8-12, thin-walled, acuminate or short-beaked dorsoventrally. Seeds usually 3 per mericarp, gray to brownish black, reniform, 2-2.5 mm long, pustular puberulent. [2n = 14.] Occurring in disturbed areas, indigenous from New Guinea, Indonesia, the Philippines, New Caledonia, and Queensland, Australia; in Hawai'i known from a single collection made in 1910 at Kahikinui, East Maui (Rock s.n., BISH). It is not known if this species has persisted. Shrubs, closely grayish pubescent with stellate and simple glandular hairs. Leaf blades deeply cordate-ovate, 7-12 cm long, margins crenate-dentate, apex acute to acuminate, petioles about as long as blades, sometimes pilose with simple hairs. Flowers solitary or paired in the leaf axils, exceeded by the leaves, pedicels 1.5-4 cm long, articulate with the calyx sometimes pilose with simple hairs and stellate and glandular pubescent; calyx cup-shaped to suburceolate, 1-1.5 cm long, lobes dentate, 1-3 mm long, pubescent within; petals included in calyx, greenish with brighter green, inflexed margins, lower surface reddish, 0.5-1 cm long, up to 9 mm wide; staminal column exserted, whitish to yellowish, 2-2.8 cm long, antheriferous in a terminal cluster; style branches coral-colored; stigmas green, scarcely expanded. Schizocarp cylindrical, 8-10 mm long, 10-13 mm in diameter, pilose, mericarps 8-9, 8-10 mm long, apex acute. Seeds asymmetrically reniform, up to 2.8 mm long, matted white or brown pubescent. Extremely rare in dry forest, recorded from Kalulu and Maunalei Valley, 210-520 m, eastern Lana'i. Grown in a naturalized state in the 1920s and 1930s in dry forest at Kanepu'u, Lana'i, where it also might be sought. A new population of about 60-70 plants was discovered in Kehewai Gulch in 1987 (Perlman 6405, BISH). Abutilon eremitopetalum is related to A. menziesii. NOTE: (3/27/97) This name Kehewai not found in Place Names of Hawaii book.  C.U. Shrubs 1-2(-3) m tall, stems, petioles and pedicels stellate tomentose and pubescent with spreading, shiny, simple hairs up to 5 mm long. Leaf blades ovate to orbicular, 8-15(-22) cm long, margins dentate, apex acuminate, base deeply cordate with lobes often overlapping, petioles 5-10(-15) cm long. Flowers solitary or 2-6 in naked cymes, exceeding the leaves, peduncles and pedicels up to 10 cm long, articulate; calyx 1.1-1.5 cm long at anthesis, lobed to near base, accrescent and loosely surrounding the fruit; corolla cup-shaped to subrotate, petals yellow to yellowish orange, 1.2-2(-2.5) cm long, undulate-dentate apically; staminal column 5-8 mm long; style branches yellow; stigmas maroon. Schizocarp dull black, broadly urceolate-truncate, 11-14 mm long, yellowish pubescent, mericarps usually 10, thin-walled and somewhat inflated, short-beaked dorso-ventrally. Seeds usually 3-6 per mericarp, blackish, reniform, 2-3 mm long, sparsely pubescent. [2n = 42.] A widespread tropical weed of New World origin, sometimes cultivated as an ornamental or for fiber; in Hawai'i naturalized in waste areas, fields, and along roadsides, especially in arid regions, from near sea level up to 600 (-1,075) m, on Midway Atoll and all of the main islands. First collected on 0'ahu in 1903 (Bryan s. n., BISH). -Plate 121. The flowers of this plant may be used in lei, in place of those of Sida fallax. Subshrubs or shrubs 0.5-1(-2) m tall, densely but closely white or silvery stellulate pubescent. Leaf blades cordate-ovate, 1-6(-10) cm long, margins serrate to crenate, apex acute to acuminate, petioles usually 1/2 or more the length of blades. Flowers solitary or, by reduction of leaves, in terminal racemes, pedicels filiform, 1-3.5 cm long, articulate apically; calyx 0.2-0.4 cm long, splitting and reflexed in fruit; corolla rotate to reflexed, petals white to yellow or pink with maroon veins and a basal spot, 0.4-0.6 cm long. Schizocarp pale brown, cylindrical-truncate, 6-8 mm long, grayish to yellowish pubescent, mericarps 5, narrowly oblong, angled dorso-ventrally. Seeds 3 per mericarp, globose-reniform, ca. 1.5 mm long, densely puberulent. [2n = 14*.] Native to deserts from Arizona and Baja California to Sinaloa, Mexico; in Hawai'i questionably indigenous, occurring primarily in leeward, dry habitats, 0-220 m, on all of the main islands except Hawai'i.-Plate 121. Only pink-flowered forms are known in Hawai'i (J. Fryxell, 1983). Annual to perennial subshrubs up to 2(-3) m tall, usually cinereously stellate velutinous and pubescent with simple hairs. Leaf blades cordate-ovate to cordate-orbicular, 2-16 cm long, margins subentire to serrate, apex acuminate, petioles often longer than blades. Flowers solitary or paired in the leaf axils, pedicels usually 2-5 cm long in flower, longer in fruit, articulate; calyx 0.3-0.5 cm long, scarcely accrescent in fruit; corolla cup-shaped, petals yellow to orange, 2.5-3 cm long; staminal column ca. 8 mm long. Schizocarp black, broadly cylindrical with flaring, truncate to emarginate apex, 1.5-2 cm in diameter, densely pubescent, mericarps 15-22, reniform-oblong, with a short dorso-apical mucro. Seeds 2-3 per mericarp, reniform, 2-3 mm long, surface punctate, glabrous or stellate pubescent. [2n = 36, 42, 72.] Occurring in disturbed sites at low elevations near the ocean throughout the New and Old World tropics and subtropics, but probably of Indo-Australian origin; Hillebrand (1888) stated that this species was in cultivation in Hawai'i and "bidding fair to become naturalized," but it has only been collected near Honolulu, O'ahu. Known from a single collection made in 1960 (Pearsall 498, BISH). Diffusely branched shrubs up to 2(-3) m tall, closely velvety stellate pubescent. Leaf blades deeply cordate-ovate, 3-10(-14) cm long, sometimes angulately 3-lobed, margins finely to coarsely crenate to serrate, apex acute to long-acuminate, petioles 2.5-5(-8) cm long. Flowers solitary in the leaf axils, pendulous, pedicels 2.5-3.5(-5) cm long, articulate; calyx 1.1-1.7(-2.2) cm long, glabrate or densely pubescent, lobes sometimes remaining joined in twos or threes, reflexed; corolla rotate to reflexed, petals maroon grading to yellow basally, unguiculate, emarginate, 1.5-2.5 cm long; staminal column yellowish, exserted, 2-2.8 cm long, conspicuously antheriferous apically; filaments spreading. 2-3.5 mm long; style branches maroon. Schizocarp pale brown, cylindrical, 8-10(-13) mm long, closely pubescent, mericarps (6)7-8, oblong, apiculate or short-spined, loculicidally dehiscent in upper 1/2. Seeds 3 per mericarp, dark brown, reniform, 2-2.5 mm long, striate papillate and striate stellulate pubescent. [2n = 28*.] Uncommon and local in dry forest, 200-520 m, on Lana'i, East Maui, and Hawai'i. A collection (Char 81.002, BISH) from an abandoned canefield at 'Ewa, O'ahu, made in 1981 probably represents an escape from cultivation. At that time all cultivated plants were descended from the Puako, Hawai'i, population; this population was later destroyed by cattle during an unusually dry year. More recently the Lana'i plants were brought into cultivation. - Plate 122. Hillebrand (1888) recognized a Lydgate collection from Lana'i varietally (ß), but no distinction is made here, although specimens from Lana'i have densely pubescent calyces, pale corollas, and large mericarps. This species has been federally listed as endangered (Herbst, 1986e). 7. Abutilon sandwicense (Degener) Christoph. Shrubs 1.5-3(-6) m tall, white to yellowish stellate pubescent and glandular tomentulose. Leaf blades pale green, thin, cordate-ovate to cordate-orbicular, 8-22 cm long, both surfaces sparsely puberulent, margins shallowly dentate with tufted pubescent teeth, apex acuminate, petioles somewhat shorter than blades. Flowers solitary in the leaf axils, pendulous, pedicels articulate apically, 3.5-6 cm long at anthesis, up to 10 cm long in fruit; calyx pale greenish yellow, 3-4 cm long, softly pubescent with stellate, simple, and simple glandular hairs, densely silky pubescent with simple hairs within to the basal nectaries, lobes deltate, 10-23 mm long; petals bright green to reddish brown with green veins toward the acute to acuminate, serrulate apex, yellowish green basally, linear-spatulate to unguiculate, 4-5 cm long, 1.4-2 cm. wide apically, ciliolate along basal margins; staminal column greenish yellow, sometimes reddish apically, 3.5-4.5 cm long, apex densely yellow antheriferous, pubescent basally; filaments 4-6 mm long; stigmas scarcely expanded. Schizocarp black, vase-like, 17-25 mm long, yellowish brown stellate pubescent, mericarps 8-10, ovate-oblong, with long-acute apex. Seeds 3 to several per mericarp, dull brown, triangular-reniform, up to 3 mm long, sparsely pubescent. Rare on steep slopes in dry forest, 300-600 m, between Makaleha Valley and Pu'ukaua, Wai'anae Mountains, O'ahu. - Plate 122. Christophersen (1934) described some aspects of variation in this species from Lualualei Valley, but the leaf, floral, and fruiting characters on which var. welchii was based appear to represent normal populational variability in the genus. A genus of 39 species of tropical to warm temperate regions of the Old and New World. Name derived from the Greek gossypion, cotton. 2.5-5 cm long; seed hairs usually white (commercial cottons) (2). 0.6 cm long; petals cream-colored to yellow, usually with a basal maroon spot and fading to pinkish purple, 3-5 cm long. Capsules 3-5-celled, globose to broadly ovoid, beaked, 2.5-3.5 cm long, the surface smooth. Seeds 5-11 per cell, lint copious, white to reddish brown. [2n = 26, 36, 38, 39, 52.] Native to the tropical and subtropical Americas, the Caribbean, and questionably some Pacific islands, but widespread in cultivation; in Hawai'i at least sparingly naturalized at Hale'iwa, O'ahu, and perhaps elsewhere. Although cultivated in Hawai'i at least during this century, the first naturalized collection was made in 1956 (Degener 24074, BISH). Shrubs 0.5-1.5 m tall, softly white tomentose. Leaf blades wider than long, usually 3-10(-12) cm wide, 3-lobed or sometimes 5-lobed to about the middle, the lobes ovate, acute or subacuminate, midvein on lower surface with basal gland absent or obscure, stipules subulate, 0.5-0.8 cm long, caducous. Flowers solitary or few in short cymes, pedicel nectaries absent; involucral bracts ovate, 15-25 mm long, dentate, with 5-9(-12) acute teeth; calyx erosely truncate, 7-9 mm long; petals bright yellow, without a maroon spot, fading greenish, 2-3.5(-4) cm long. Capsules 3-celled, coriaceous to woody, ovoid, cuspidate, 1.2-1.8 cm long, black-pitted. Seeds 2-4 per cell, ca. 5 mm long, densely covered with reddish brown lint. [2n = 52*.] Occurring primarily in arid, rocky, or clay coastal plains, 0-120 m, on all of the main islands except Hawai'i. - Plate 122. Gossypium tomentosum is one of the tetraploid cottons and presumably was derived from a Neotropical ancestor. corolla white or yellow, campanulate to rotate; staminal column shorter than petals, terminated by filaments; carpels 8-14, ovules 1-3 per carpel; style branches as many as carpels; stigmas terminal, capitate. Fruit a pendulous, inflated, oblate schizocarp, mericarps reniform, without awns, scarious, each dehiscing into distinct valves or the valves remaining joined basally, adjacent valves sometimes coherent.black, Seeds brown or ovoid-reniform, glabrate to puberulent. A weedy and widely distributed genus of 5 species of the New World tropics and subtropics. Named in honor of Louis Antoine Prospere Herissant, 18th century French physician, naturalist, and poet. 1. Herissantia crispa (L.) Briz. Diffuse, sometimes scandent herbs or subshrubs with slender branches up to 1.5 m long, pubescent with stellate, glandular, and usually simple, spreading hairs. Leaves cordate-ovate, up to 7(-10) cm long, margins crenate to serrate, apex acute to acuminate, lower leaves petiolate, the upper ones subsessile and amplexicaul. Flowers solitary in the leaf axils, pedicels filiform, 1-4 cm long, geniculate; calyx 4-7 mm long, reflexed in fruit; petals white, 0.6-0.9(-1.1) cm long; staminal column up to 3 mm long. Schizocarp whitish, fluted, papery, 1.5-2 cm in diameter, silvery hirsute with simple hairs, mericarps 10-12(-14), apically and dorsally dehiscent. Seeds 1-3 per mericarp 1.5-1.8 mm long, puberulent. [2n = 14.] Native and widespread in the New World tropics, but now nearly pantropical, primarily at low elevations; in Hawai'i naturalized on an arid ridge west of Olowalu Valley, West Maui. First and only collection made in 1986 (Herbst et al. 8715, BISH).